A fresh coat of stain on your deck will not only enhance the curb appeal of your home with a seemingly new deck, but it will also allow you to make the most of your deck during the warmer months of spring. One of the best methods for improving the appearance of your deck is to stain it at the start of spring. A fresh coat of stain on your deck will not only enhance the curb appeal of your home with a seemingly new deck, but it will also allow you to make the most of your deck during the warmer months of spring. As you are preparing your home exterior for warmer weather, we have compiled a brief list of reasons why this should be the year that you decide to stain your deck. Trust us; you will be glad that you did! The right color of stain can quickly transform the appearance of a deck that has been affected by winter weather. 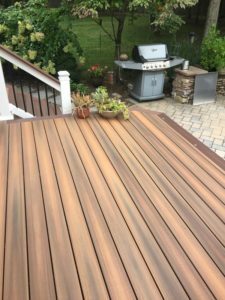 If you want to revitalize the look of your deck by providing it with a fresh, new look, staining is one of your best options to consider. When selecting a stain color, it is best to choose one that complements the existing colors of your home style and landscape. Many homeowners are conflicted on whether to paint or stain their deck. It is important to point out that staining a deck is a significantly easier process out of the two options because there is no need for primer. This also means the process can be completed twice as fast. One of the best ways to prevent excess moisture from ruining your deck is by staining it and then restaining it periodically. It is essential to understand that moisture damage can lead to cracking during the winter months. If you have a wood deck on your property, you need to be concerned about rot. When you coat your deck with a stain, you prevent the wood from rotting. Rot can cause structural issues with your deck and make it a major safety hazard. Also, by staining your fence you are lessening the chances for mildew and mold growth.